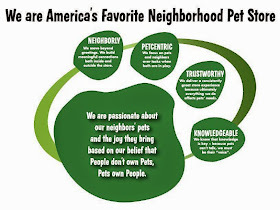 The team leaders of our Pet Supplies Plus stores are always looking for ways to be more neighborly. To us that means being a fun place to visit as well as bringing value and convenience to our neighbors when they shop. But it can also mean joining with other community organizations to make an impact on the lives of their neighborhoods' furry creatures. I run a group called the Bottle Baby Crusaders of San Antonio Pets Alive. This group is dedicated to helping the over 600 orphan puppies that need help each season and the fosters that take care of them. We create a kit for those that take these orphan puppies that include Esbilac formula, blankets, bottles, syringes, rice packet for heat source, Karo syrup and other items that a foster might need. We hold a bake sale each month to raise the funds to complete these kits and to purchase puppy food for fosters that are taking care of these puppies and if they have a mom. I met Roxanne in October of this year, when we were invited to hold our bake sale during an adoption event at her store. I was very impressed with her and her staff and the help and warm welcome that they gave all of us during the event. At that time, I found out that Roxanne personally maintains a cattery for our foster kittens that helps to get them adopted! Roxanne asked how she could help the Crusaders and her and some of her staff are helping us by making the rice packets and blankets for our kits. This selfless act means a great deal to us as we can redirect some of our funds to other needs! Roxanne then asked me if I would be interested in doing an angel tree and both stores to help our mission. To date, we have received a lot of supplies that are helping the fosters who have lost their jobs recently to keep their animals in their home instead of having to go back to our onsite facilities. We have also received supplies for our kits as well. We know that all this would not be possible without the support of Roxanne and Dale and their supportive staff to promote our cause or the fact that their customers are as generous as they are. Roxanne and Dale are wonderful and compassionate people who have shown a commitment to helping the animals in the San Antonio community and the fosters of San Antonio Pets Alive. Their stores are a wonderful place with warm , friendly and helpful staff, that I do not find in other national chains. Although I live out of town, I shop there as often as I am in town. These people are a credit to your company and its mission and I hope the corporation recognizes this. I am a foster for San Antonio Pets Alive. I attend adoption events at store #7006 on a regular basis. The manager of this store, Roxanne, is amazing! She goes out of her way to make sure all of our fosters are comfortable, have all they need to set up, and plenty of space to do so. Plus she advertises to the public for us when we will be there and is always so happy to see any of us. She has also extended an open invitation to all of us, for those who may not be able to bring their foster pets to weekend events, to come and set up whenever we want to at her store! She helps promote all that can be promoted to help so many animals! She is an astounding person and a super plus for this company! Her employees are absolutely wonderful also. I have never been there that they are not helpful, smiling and respectful! We all love going there for our adoption events and some of us drop by just to say hi and shop for our own animals! It is definitely a pleasure to shop in this store and to be treated so wonderfully! We also love the wide range of products Roxanne has in her store! Rarely do any of us have to go anywhere else when looking for something. It is truly an amazing experience. Especially in this day and age, when usually customers are treated rudely and ignored. NOT HERE! Roxanne and her staff are helpful and also very knowledgeable on all their products! I wanted to share with you the very positive experience I have working with your stores 7006 and 7009, and their managers: Roxanne and Dale. I lead the Canine Baby Foster Team for San Antonio Pets Alive! (SAPA!) I have recently worked closely with the local PSP team to collect donations for our team. SAPA saves hundreds of orphaned puppies (and a thousand kittens) each year and the costs associated with raising them are prohibitive! I am confident that our next season will be substantially improved working in partnership with the PSP team. They are generous to a fault, extremely helpful and also creative problem solvers. They truly want to help us solve our challenges. It's obvious they truly love animals and people. Their stores are always very clean and well organized and their staff are always helpful and seem happy. No one ever told me that volunteering with animal rescue would involve carrying so many heavy things around! I am truly grateful to your team for being willing to help on every level. Even when that means helping move a pallet of cat litter! Roxanne and Dale are a credit to your organization.